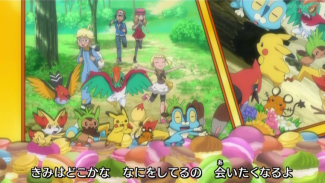 "Peace Smile" (ピーススマイル) is the second ending theme to Pocket Monsters XY. It will also be used as the ending theme to the Pikachu short Pikachu, What is This the Key To? It is sung by J☆Dee'Z. Used in XY 028 - ??? Issho ni koete ikou yo! Kaerou kaerou kimi no moto e! Where are you? And what are you doing? My courage definitely becomes the key that makes me stronger, y'know? Let's get through the tough times together! Let's go back, let's go back, back into your arms!